The year has flown by faster than the airplane turnover at Ben Gurion airport. Rosh Hashana is in a couple of days, and I’m trying to distract myself from it by preparing Iraqi Apple Jam and planning menus. The more difficult and foreign the recipe the better, although I inevitably end up returning to my usual, well tested recipes that I can make in my sleep. This is how the New Year ends up as well. I begin with many good intentions and then revert to my usual, well tried and tested self. Living with flawed humanity is giving up on a lot of fantasies. It all began with a summer family holiday, where I had to admit to myself that there is no such thing as the perfect holiday, with perfect behaviour from the kids. The children will fight, they will whine and whinge, they will complain when we go to museums and they will say repeatedly, ‘This is boring.’ So I let go of my unrealistic expectations and I catered to their gelato needs. We all got on better and had fun in between the fights. I’m also working on being curious about the humanity of others. Half of Israel came with us to Italy and it was interesting to see Israelis out of their comfort zones. We bumped into them everywhere. When I look for the fragile humanity in others I’m less judgmental. The other day, I gave well intentioned, (and what I thought was sound), advice to someone close to me. They turned around and said, ‘Who are you to judge me? You don’t know what it’s like to be me.’ It hurt to hear it but they reminded me that it’s not my place to judge, or give advice to anybody. It’s not an easy resolution. It’s much easier to cook. It was the perfect summary of what I’ve been experiencing. I choose to recognise and accept my human frailty. And most of all, be kinder to myself so that I can be kinder to others. Shana Tova – A Blessed, Sweet, Kinder Year to all of You! 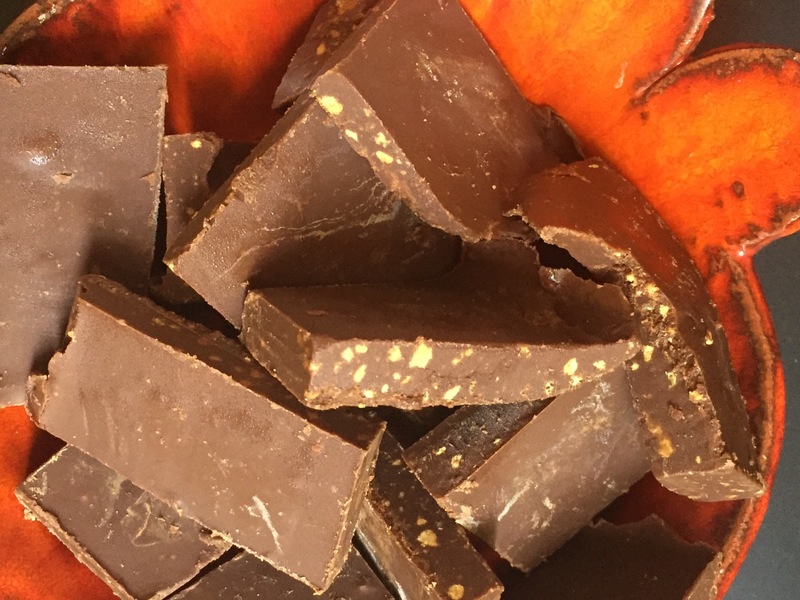 One clear kindness that anyone can do for themselves is make this delicious, easy parve Lotus Chocolate recipe that I learnt from a Jerusalem Shabbat table. It’s the perfect ending to any meal with tea and coffee and nobody can believe that they’re parve. Melt Lotus Spread and Chocolate in a double boiler. Spread melted mixture on baking paper in a tin and sprinkle with grated Lotus Biscuit. Refrigerate until firm. Cut chocolates into squares and store in fridge or freezer.